When you think all hope is lost, never fear your dentist is near. Have you ever chipped or cracked a tooth? Have you ever had a tooth that had too much decay that a filling wasn’t the answer? Have you ever had a tooth that had fillings before th at now you need something more to save the tooth? There is hope for that tooth. We can possible save that tooth with Root canal treatment. With this treatment we are able to stop the inflammation and/or infected root of the tooth. 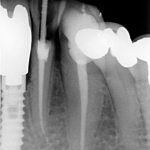 Root canals are complete with more than one visit. First the dentist must treat, remove the infection and/or nerve and closing the tooth where accesses to the root is. After the tooth is healed a crown or filling is put into place. Root Canals are often covered under insurances; call our front desk for more information today! !